We can see in the picture above several silver coloured can capacitors. They all have a black base which allows them to be placed by machine onto the top of the PCB. Therefore they are surface mount or SMT capacitors. The manufacturers often call these capacitors Chip Type. Unfortunately they are often mistaken for Polymer capacitors. This is incorrect because polymer capacitors do not have electrolyte. You can see that the big ones in the photo have K or X vent stamps. If the capacitors have vents then they are not polymer because the vents are to allow the gas to escape if the capacitor fails and makes a chemical reaction inside. The smaller ones do not have vents because their small construction or different type of electrolyte will not result in a significant build up of gas when the capacitor fails. So it is possible that these capacitors will fail. It is also possible that mishandling of the product may result in the user breaking the capacitor off the base. That would also require replacement of the capacitor. Does the PCB have a Position for SMT caps only? If you look at the lower capacitor on the left you will see to the right of it that there is an empty position where an SMT capacitor has not been installed. You can see that there are two solder points there. One is for the negative and one is for the positive. There is no thru holes on this PCB to allow you to use a radial capacitor instead of an SMT one. The SMT caps have two little metal tabs sticking out from their base. So if you needed to replace one you would have to heat the tabs one by one in order to desolder the old capacitor from the board. Then you would place the new capacitor in position and heat the tabs one by one and add solder. Yes it is possible to do this job with hand soldering. Here we can see the negative stripe for these chip type capacitors. 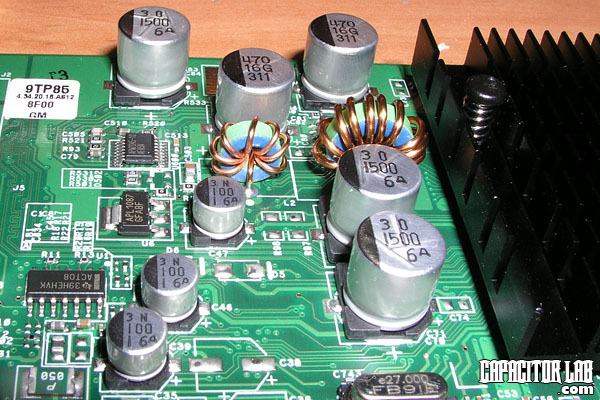 The can type capacitors used in computer equipment have polarity so it is very important to install them with the right polarity otherwise they will blow. The SMT chip type capacitors have a hemisphere mark on the top which you can see in the photo. This indicates the negative lead. If you refer to the above photo there is a + marked on the board. So you would install the cap there with the hemisphere on the other side because that lead is not +ve it is -ve.